Barbara Warchalewska born Poznań, Poland, began playing cello at age seven. She is student of Thomas Demenga at Hochschule für Musik Basel, enrolled in the Soloist Master Program. 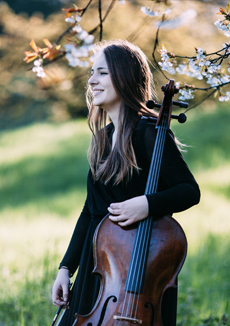 Prizewinner and finalist of international cello and chamber music competitions, she was a finalist of Concerto Competition in Calgary, Canada, and performed with Calgary Philharmonic Orchestra; attended master classes working with renowned cellists Frans Helmerson, Jens Peter Maintz, Philippe Muller, and Wolfgang Emanuel Schmidt. She has given concerts as soloist and chamber musician in Europe, North America, and Asia.